Join Rock/Creek at our Two North Shore location, on Friday, May 22, at 6 pm, as we host a trail running clinic conducted by world-class mountain runner Shiloh Mielke. Scenic City Trail Marathon racers who have pre-registered may also pick up their race packets between 4 and 7pm. The clinic is open to the general public, and we invite you to come chat with the racers who will be in town from all over the country. We currently have 265 racers signed up, with 10 states represented. A few details about Shiloh for those of you who haven’t met him at local races: Elected to the 2009 Vasque Trail Team in April, Shiloh, 29, joins other team members on the basis of their dedication and accomplishment with their sport, as well as their holistic reputation. Shiloh, a native to the Asheville, North Carolina, area has been making his mark along the high rolling mountain ranges since 2006. What started out as a track and cross country career from Brevard College and Northern Arizona University evolved into a placement on the 2006 US World Mountain Running Team. He ran again in 2007 and placed an impressive 37th overall and 2nd American. Mielke has plans to compete in the Mount Washington Road race, the Cranmore Hill Climb (host of the 2009 US Mountain Running Championships) and the World Mountain Running Championship in Camodolcina, Italy. In between those races, he plans to head home to Asheville and improve his race record of 2 hours 16 min 55 sec at the infamous Shut-In Ridge trail race. Shiloh’s leadership in the mountain running community certainly wins him titles, but more importantly, he inspires people in the outdoor community. We’re looking forward to sharing Shiloh’s accomplishments with the trail running community. His talk will be a great kickoff for the Scenic City Trail Marathon & 1/2 Marathon weekend. This race is the first of three Rock/Creek Trail Series races supported through the Vasque Project, powered by Boa Lacing System. 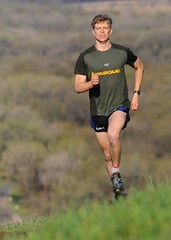 Vasque will also be involved with the Rock/Creek StumpJump 50k and the Lookout Mountain 100k.